When Birthing Pod got the axe back in January, many Pod players sold their decks, quit the format, or generally lost hope that they would ever see Melira and friends back in Modern. Collected Company wasn’t going to let her die. Company has been making waves in Modern since it first appeared, and although we haven’t had any major events to decide what deck will be the “best” home for the card, it’s clear that Company is living up to the hype. But if there’s one thing we’ve learned from past Modern seasons, it’s that the Melira Pod BGW shell is just as strong in a toolbox deck as it is in Abzan Midrange. Never bet against BGx, and never bet against Pod. So it comes as little surprise to many Modern players that Abzan Collected Company is rapidly emerging as the home for Collected Company. Melira is back, and this time, she’s bringing some new friends. If I had to make a prediction about which Collected Company deck makes it to the top, I’d tentatively lean towards Abzan Company. It’s had the most paper successes so far, has started to see a big uptick in MTGO activity, and has all the building blocks we would expect of a next-big-thing style deck. This article is an introduction to the deck, its cards, its core strategy, and how it plays out in the format. Whether you are looking for the hot new Midrange/Combo hybrid deck in Modern, curious to deepen your understanding of the deck, or dust off those old Pod staples, this article has something for you. No matter what you call the deck (Podless Pod, Abzan CoCo, Melira Company, etc. ), the Abzan toolbox deck is back in a big way and Modern players everywhere need to pay attention. At the time of its (un)timely demise, Birthing Pod decks had a lot of variations. To understand Abzan Company, it’s important to acknowledge these predecessor builds. Kiki Pod style decks had more or less vanished by the time Siege Rhino hit the scene, so Abzan-style decks were making up the majority of Pod decks we saw. Included in those were the venerable Melira, Sylvok Outcast/Kitchen Finks/Viscera Seer/Murderous Redcap combo decks that had been part of Modern for years. More common, however, were Spike Feeder and Archangel of Thune engines, a switch made to combat increasing graveyard hate. Rhino saw the explosion of more midrange oriented Pod lists, decks that drastically reduced, or outright abandoned, the combo in favor of more interaction and a more value-driven toolbox. Abzan Company might be a new deck, but already we are seeing lists emerge in all of these older traditions. The lists have more restrictions because of the deck’s namesake (Company’s 3 CMC requirements affect deck building to some extent), but they still include many familiar faces. The first list is a March 29 finish from the Arcanis Deluxe event, a 209-player Spanish tournament that saw the first big Abzan Company finish in Modern. Its pilot, Ivan de Castro, mixed the Melira combo plan with a more aggressive Goyf, Voice, and Knight of the Reliquary strategy. His list also had none of the traditional BGx interaction, namely Abrupt Decay and a very low land count (Two cards are missing from the original list). I’m not willing to go so far as to call this a sub-optimal decklist, because it clearly has results and there’s a lot of interesting decisions made here. But I also think it doesn’t quite line up with the later Company decks we see after a month of tinkering. The low land count is alarming, as is the relative lack of combo pieces. The deck isn’t “bad”, per se, but it’s probably “immature” relative to later versions. Abzan Company made a few showings during the SCG/TCG States blitz of early April, including a a 2nd place finish at TCG Mississippi, another 2nd place finish at TCG Iowa, and a 3rd place at SCG Puerto Rico. But it wasn’t until early May that it got its first big North American appearance at the SCG Premier IQ in Portland. Brad Rutherford piloted his list to a 1st place finish at Portland, combining some of the earlier tech from de Castro’s list with some older elements of Melira Pod lists: maindecked Decay, more combo pieces, more mana producers, etc. Rutherford’s list represents a much more focused approach around the combo. Between Anafenza, Melira, Finks, Seer, Feeder, Redcap, and Archangel, 50% of the creatures relate to the life/persist/damage combo in some way. Rutherford hasn’t completely eliminated alternate gameplans, keeping 3 Goyfs and 2 Oozes in for an aggro option and adding Decay for interaction. A lot of MTGO lists have taken after this model, although we’ve seen Goyf as an interchangeable slot with Voice. The final list I want us to consider is a more traditional Goyfless combo list. Sam Pardee brought this to Channelfireball’s video series, modifying Rutherford’s initial list as only a Pod veteran could do. This included improvements to the manabase, adding more toolbox options to the maindeck, and committing more heavily to the Melira/Anafenza combo. Pardee’s list strikes me as very clean, and cleanliness is important in decks like Abzan Company that can easily become a mess. The grind is much better in this deck, courtesy of the increased Township and Scooze count, which is important if you need to break stalemates. In many respects, this makes the deck similar to the more midrangey Pods we saw at the end of the previous season. Adding Spellskite and Pontiff give you way more toolbox options that we saw in Rutherford’s build. 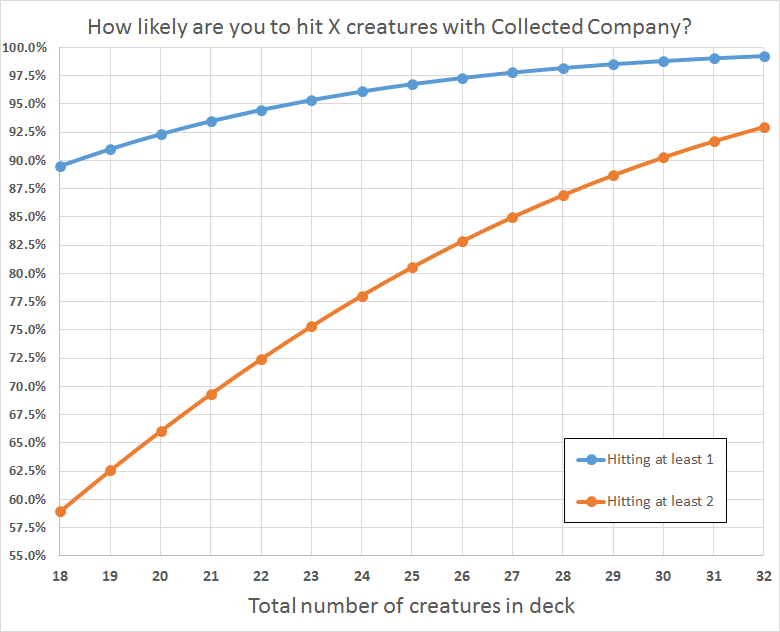 I do think the Company math is lacking here (only 26 flippable creatures), but it’s not far off. These lists have a lot of similarities, but the differences give you some sense of the various ways you can take the deck. In this next section, I want to dive into these individual cards to highlight some of the choices and synergies in the deck, as well as how you can pick one set of cards over another. As with all new and newer decks, it’s hard to identify the “core” of Abzan Company. It’s even harder when we are slogging through an offseason period without major Modern events. So all of this is based on the lists we have seen so far and how those cards appear to be faring in the format. With that in mind, here are the main players in Abzan Company, why they are important, and how their synergies work in practice. These synergies and cards should apply equally to more value-oriented Abzan Company builds as with combo-focused ones. There are a few important differences between Company and its obvious comparison, the late Pod. The first is cost restriction. Pod decks made a name for themselves not just in cheating mana costs, but also in ramping to bigger creatures. Rhino was a big contributor to the card’s eventual banning, and that kind of monster isn’t a great fit with Company . Although you will see cards higher along the curve here (Reveilark and Archangel are big examples), this will be the exception rather than the norm. Company needs to flip two creatures to generate value, and you can’t run too many cards that interferes with that. This imposes important deckbuilding restrictions on Company players. The second critical difference between Pod and Company is instant-speed. Pod was a mainphase-only activation. Company is an instant, which opens up options that Pod players could only dream of. Play during combat to ambush creatures and screw with math. Play at EOT to breach counterspell walls. Play in response to removal to combo off on the spot. Company might not have the same precision/selectivity as Pod, but being instant speed is a great trade. Also, Pod always had issues against sweepers, and it doesn’t get better than instant speed Company when recovering from something like a turn 3 Anger of the Gods from Jund. As a related point, and perhaps a third difference between Company and Pod, Company is a great topdeck on an empty boardstate. Pod? Not so much. This gives you better topdecking in some situations, which can be a solid edge that Abzan Company has over its predecessor. When playing Company itself, be aware of different synergies between your cards. The biggest one, which I’ll get to later, is with Eternal Witness: that kind of recursion is just too much value for most fair decks to handle. But you can also use it to chain into a Chord in your hand, get your combo online, mess with an opponent’s combo (Skite to stop Twin, Melira to beat Infect, etc. ), or set up for a big attack of your own. Also, be aware that Company is random. It is not just Pod 2.0, and I have in fact probably oversold some of its strengths in comparing the two (hint: the better card is banned). But its unique strengths do keep it viable in the format and do drive the deck. Abzan Company’s Chord serves the same function as it did in Pod. It gets you the exact bullet you want when you want it. The big difference now is we no longer have Pod itself, which makes Chord’s selectivity even more valuable than it was before. This affects how you play the card and how you sequence your Company and Chord castings. For instance, in a deck with 4 Melira and 2 Anafenza (interchangeable combo pieces for your lifegain engine) you probably don’t want to “waste” your Chord fetching these cards unless you desperately need them right now (e.g. if lethal Infect is on the way and you need Melira). You should probably just bank on flipping these off Company. When Chording, Seer or Varolz would often turn out to be better options, because your deck only plays 3 of the sac outlets (Finks, by contrast, has 4 copies). Or just save Chord to get the lone Redcap, in case you are playing against decks that can theoretically win through the life combo (RG Tron, Amulet, and Twin come to mind). In general, you will want to Chord after a Company, but still always ask yourself if that’s the right choice to make. Another big strength of Chord is its synergy with Company flips. All those creatures you reveal off Company are happy contributors to convoke. Even better if you get Wall of Roots in there which effectively doubles its contribution to the Chord. This enables some really explosive end of turn plays, whether for a giant attack or just to get the combo during the opponent’s end phase. Remember that none of your combo engines require tapping, so living the dream of Company into Chord into combo is totally possible with this deck, and all at instant speed. Anafenza is not a strict upgrade to Melira in a metagame where Infect was tier 1 for so long. But outside of that matchup, she’s a huge boost over Melira to Abzan Company’s gameplan. Starting with the obvious, she’s a substitute combo engine for Melira in the persist chain: Finks will come back with 1 toughness which makes it a viable bolster option no matter what other cards are on the field. Rinse and repeat until you have as much life as you want. This is a nice boost to the deck’s combo, particularly because Company needs redundant combo pieces to work, and you’d rather run 4 Anafenza instead of 4 Melira But the real win is in Anafenza’s contributions to your midrange and aggressive win routes. She puts a LOT of power on your side of the table, which is not something you can say for Melira. This includes double bolsters off Company as well as bolstering herself for a 3 damage swing off a turn 3 Finks or Wall. Pod decks were always good at switching from combo to beadown, and Anafenza really makes that possible in these new Rhinoless decks. I have heard arguments in favor of ditching Melira entirely in favor of just 4 Anafenza and 2 freed slots. If Infect’s metagame share keeps dropping, this isn’t necessarily the worst plan, especially if this deck keeps taking on a more toolbox approach. But if you want combo consistency and in most metagames, it’s a bad one. Don’t just think of Anafenza as a better Melira. Think of Melira as Anafenza’s 5-6 but with an upside in one matchup. Even without the sac engine online, Melira (and Anafenza) are still important in keeping your Finks going and going and going. Never underestimate the power of immortal Finks, whether or not you have the sacrifice outlet to accompany it. Also, it really is nice to have even more ways to mess with Infect in game 1. Speaking of the immortal Finks, the Ouphe is just as good today as it was in the past. In fact, it’s probably better, given the prevalence of Burn. There’s not much more to say on Finks except it’s highly relevant in this current metagame and Finks is still very strong even if the combo isn’t online. Or, better yet, if only the Anafenza/Melira side of the combo is online. Unkillable 3/2 creatures are still very strong, even if they only gain you 2 life each time they “die”. It’s this sort of grinding pressure that gives you a lot of game in the fair matchups. The Township/Finks synergy is even better today than it used to be, because we are seeing an uptick in these kind of grindy Jund, Abzan, Grixis Control, UW Control, and otherwise “fair” style decks that don’t want to screw around with an unkillable 3/2 clock. There will be many matchups where you want to play beatdown and not combo, and in those matchups, Finks is your workhorse. Witness is probably my favorite creature in Abzan Company, and also the creature gaining the most in the shift from Pod to Company. Before the ban, Witness was much more a recovery tool or a grinding tool. After it, Witness has retained these qualities but added an explosive dimension to her skillset. Company into Witness is as amazing in practice as it sounds on paper. So is Chord into Witness into Company, or even just the classic Pod line of Chord into Witness into Chord. One thing to be aware of with Witness is its vulnerability to graveyard hate. Indeed, this is a big thing to keep in mind with the deck generally. The pre-banning Value Pod decks managed to get around this weakness to some extent with stuff like Rhino, so even if an opponent shut down your recursion engines, you still could deploy high value midrange monsters. But Company imposes restrictions on your deck that don’t allow this kind of flexibility, which means graveyard hate is better against Abzan Company than it was against the later incarnations of Pod. Witness will suffer accordingly in any matchup where stuff like Rest In Peace, opposing Scavenging Oozes, and/or Relic of Progenitus start to appear. No Modern deck is more responsible for the continued relevance of “Bolt The Bird!” than Birthing Pod decks. Abzan Pod continues that storied tradition. People will try and negotiate this slot between BoP and Noble Hierarch, but Abzan Company is a place where you really want Bird. The key factor for me is Anafenza. Bolster creates more situations where you want to swing en-masse, especially on top of those 3 Townships. Hierarch doesn’t do anything to contribute to that gameplan. You can’t even go turn 1 Hierarch into turn 2 Anafenza into turn 3 Finks and swing with a bolstered Anafanza, because Hierarch steals her trigger. These situations are much more favorable to Hierarch over BoP, and that’s why you want to give Birdy the nod over Abzan’s default stalemate breaker. You just don’t need Hierarch because her stalemate cracking ability is worse than, and anti-synergistic with, that of Anafenza and Township. And let’s not forget all the trouble Hierarch can get you into with your black mana, especially in games 2/3 if you bring in Thoughtseize. Wall is another one of those Pod ex-patriots that found both a new home in Abzan Company and also newfound synergies. One of Wall’s biggest limitations is its once-per-turn clause on the mana generation. Pod could abuse cross-turn activations, but not like Company can. Company and Chord are both castable at instant-speed, which lets you put double or, in the case of Chord, TRIPLE duty into just a single Wall. You can add a token to the Wall on your turn for +1 mana, and then do it a second time on your opponent’s turn. Don’t forget to convoke it too if you are casting Chord. You can also make similar plays off Company, where Wall is effectively a hasted manadork. Flipping a Wall and one other creature is an immediate +3 mana towards Chord. These kinds of synergies were also at play in Pod decks, but with Pod stuck at sorcery speed, you didn’t see as much cross-turn activation, and Wall wasn’t as explosive as it is with Company. As one last endorsement of the plant, it’s a serious roadblock against Burn, either forcing them to waste an attack and a valuable spell to kill it, or soaking up 2-3 damage per turn. Seer might be Modern’s cheapest and most efficient creature sacrifice outlet, but it’s also not the most interesting card in the deck. It’s one of the few cards in Abzan Company that doesn’t change much from before the Pod banning to after. Yeah, you need to be aware of when you want to Chord for Seer versus Chording for something else, but those were the same decisions you had to make back in the Pod days. When you are running Seer, the biggest thing to keep in mind is not how Seer has changed in the new metagame, but rather how he has stayed the same. This means using him to generate some value from removed creatures, manipulating your draws during a combo execution (stack the deck! ), not playing him into needless danger, etc. Just remember that sacrifice outlets are the least common part of your engine, so plan Company/Chord accordingly. Township was the unsung (depending on which circles you ran in) hero of Pod before the ban. There are few cards in Modern, perhaps no cards at all, that are better at breaking open fair games than Township. It’s the ultimate grindhouse (although who knew the “ultimate grindhouse” looked so quaint and medieval!). It’s basically unjustifiable to run fewer than 2 Townships, and you need a very good reason to not be running 3. If we learned anything from the Pod decks of last season it’s that Township is everything it’s cracked up to be. It turns any creature into a win condition. It makes Finks into a gamechanging monster. It makes combat math much worse for opponents, and expedites your own clock. It’s also probably the best manasink in Modern, both for converting your manaflood into value, and for transforming otherwise useless mana dorks into win conditions. Unlike typical Abzan Midrange, a deck that also sometimes runs Township to break stalemates, Abzan Company has the creature density to make this into a real monster. Don’t leave home without it. Elves is a Collected Company deck that can just race opponents without any interactive aspirations. We are not Elves. The Abzan Company combo is not nearly as fast and not nearly as consistent as the Elves engines, and for some decks it won’t even spell the end of the game (Twin, RG Tron, Amulet Bloom, and Infect/Affinity if you can’t stick a Melira). This means we want some degree of interactivity, particularly because our toolbox creatures can’t be as reliable as we might like. Pod was able to run these kinds of maindecked bullets like Reclamation Sage and Qasali Pridemage. We can do this, but it’s not nearly as effective because we can’t get them as consistently. This increases the need for catchall answers like Decay. Indeed, one of the biggest weaknesses of Abzan Company is the need for more combo redundany (hence 4 Anafenza and 2 Melira) instead of a more silver-bullet approach. This forces you away from interaction like maindecked Thoughtseize and +1-2 Decay, because these cards screw with your Company flips. Rhino Pod lists were notorious for this maindecked interactivity, and Abzan Company can’t support it as well. None of this is to knock Abzan Company too much, or to suggest the toolbox approach can’t work at all here (it can). It’s just to emphasize the importance of those 2+ Decays and why those need to be in the deck. Even if you go all-in on the core cards above, you are still left with basically a dozen slots for other, nonland options in your deck. These cards, and the ratios of the above cards, are going to determine where your Abzan Company list falls on the continuum of combo to value, and all the options in between. Here are some ideas in those categories, whether to help protect/enable/find your combo, promote a more aggressive gameplan, or just give you more utility in the metagame. The first three cards on this list, particularly Goyf, are all in competition with one another for this two-drop beatdown slot. I’m starting with Voice because it’s the biggest throwback to the Value Pod lists of last season, and probably the most obvious go-to for an Abzan Company player who wants to fill this slot. Voice’s biggest advantages are a) its resilience and b) its strength against Twin and other decks with control elements. This is a hard creature to kill and a harder creature to interact profitably with. It’s also almost impossible for control decks to beat this card in a fair fight, so they either need to combo out (e.g. Twin), or topdeck those Paths to clear away a Voice. Then again, Voice’s biggest disadvantage is by far its speed. Some decks will actually just treat this as a Grizzly Bear. Meanwhile, something like Goyf or Scooze could deal real damage. Voice is a metagame call, plain and simple. Facing lots of Burn, Infect, Amulet, Affinity, and other minimally-interactive fast decks? Voice is not going to cut it. Facing decks that try to play fair, particularly URx ones? Say hello to your not-so-little friend. If I were playing Abzan Company tomorrow, I’d sleeve up 2-3 Oozes and call my two-drop beatdown slot finished. Ooze is the perfect balance between the power of Goyf and the anti-control elements of Voice (there isn’t a decent control deck in the format that isn’t playing Souls and/or Snapcaster). Ooze also gives you recovery power against Burn, maindeck graveyard hate against a variety of decks (don’t forget the mirror! ), and another manasink when games go long and you need to enter the grind. There will be some games where Goyf’s 3-4 power on turns 3-5 is more economic than Ooze’s 2-4 power in that same window, especially given the mana investment that needs to go into Ooze to get it there. But when you weigh all the variables, you will find that most metagames are diverse enough that you don’t just want to race. You also want interaction, grind-power, and lifegain. Ooze gives you all of that, which is one reason to include it over Goyf. I wouldn’t run both because then you are too heavily into beatdown slots and won’t have enough room for toolbox creatures and/or interaction like Decay. Shaman solves a lot of problems the Company deck would otherwise have. But this comes at the steep price of being very slow. In exchange for the unparalleled selectivity from Shaman activations, you need to play a “summoning sick” Pod that dies to the most-played removal spell in the format. That’s great against decks like Abzan (Pathing a Shaman just sets you up for a turn 3 Company), but terrible against Jund, Grixis Delver, Twin, Grixis Control, UWR Control, and all the red-based control decks that are emerging to bring Bolt back to the forefront of Modern after a brief vacation. Shaman is also just too slow against fast decks like Burn, Affinity, Amulet, and Infect. I think she’s a viable one-of in a durdly metagame where people are trying to be too fair, especially one with less red. But that isn’t the metagame we are in now, and it’s one reason I would suggest Company lists shy away from the card for the time being. If you include no other toolbox creatures in your deck, you still need to make room for Spellskite. The card is just too powerful at protecting your own creatures (relevant against Grixis Delver, Jund, Abzan, etc.) and in screwing with an opponent’s gameplan (Twin, Infect, Burn, etc.). Starting around turn 3, particularly if you have an active Wall, you will almost always be able to threaten a Chord into Spellskite, and opponents will have to respect this or pay the price. As an added bonus, Skite will almost never steal bolster triggers because of the 4 toughness, which is something you have to worry more about with other low-toughness toolbox creatures like Pontiff or Sage. Abzan Company is tight on toolbox slots, and if Spellskite is one of your non-negotiables, Pontiff is probably the second. He’s cheap, mass removal that doubles as a clock and is flippable off Company. You’ll find him a go-to Chord target in the Infect, Affinity, and Elves matchup (the latter a common one on MTGO). He’s also great at clearing out those pesky Souls tokens, and a really scary sweeper in the Grixis Delver match when facing down Pyromancer and his minions. Bonus points for using it to stop a lethal Exarch attack (hard to win with a million 0/3s!) or outright killing Mites. This kind of flexibility is rare in a toolbox slot, and it’s one of the big reasons to run Pontiff as your Spellskite backup. Last season, we saw the slow abandonment of Melira’s combo package in favor of the much more compact Archangel package. I don’t think this is the way you want Company to go, because it’s just one more slot you need to include that makes your Company slots worse. Feeder is also basically just a Kitchen Finks that doesn’t combo well with Melira/Anafenza, so going up to an effective 5 Finks just dilutes the other toolbox options you could put in that slot. Sure, you can Chord for Archangel, and the combo is still a good way to avoid graveyard hate, but that comes at the steep cost of making your deck less efficient, and I just don’t think that’s where you want to be with Company as your main reason for playing the deck at all. Although these are the biggest entries on the toolbox and alternate card list, here is a more complete selection (but still not exhaustive) listing of all the different options at your disposal. Company might not give you the same selectivity as Pod, but it doesn’t mean you can’t play the same toolbox approach and either snipe them off Chord or gamble on them off Company. The metagame jury is still out on which Company deck will emerge at the top of the heap. My money is currently on Abzan Company because I don’t want to bet against anything remotely related to Pod, and because it’s easier to convert paper success (of which Company has lots) into MTGO and major event success. Decks like Elves might have the MTGO success, but it’s generally harder to translate that into a GP T8. And who knows? Maybe both decks can happily coexist in the format’s top tiers, each doing their own thing. Overall, I am excited to see Abzan Company rise in Modern, and look forward to seeing what it will do in the coming months. It’s a cool deck, fills important metagame gaps, and provides a home for all those disenfranchised Pod players of the previous season. Sleeve up those old Pod staples and go show your local Modern scene that Melira and Company can’t be kept down! EDIT: (5/18) Changed some wording in the Melira paragraph because an important point wasn’t clear. I’ve been playing this deck pretty much since it became legal, and I’d agree this is a pretty decent write up. The one glaring issue I see right now that isn’t just a deck preference is the comment on cutting Melira. You should always have at least one in your mainboard no matter what the meta is because she can be a 4th piece in the combo with anafenza to grant your whole team infinite power. The 3 card combo with finks often makes it so your opponent can’t win. The 4 card combos available almost certainly just actually win the game (4th cards being blood artist, melira/anafenza, redcap off infinite scry). It really should say “ONE could make an argument…” followed a few sentences later by “But if you want combo consistency, don’t just think of Anafenza as a better Melira. Think of Melira as Anafenza’s 5-6 but with an upside in one matchup. ” I’m actually going to change this to be clear, because I don’t want players to get the wrong impression. What’s the Twin match up like? Melira and company are back with a vengeance it seems. Good. Just one little thing that bugged me: ‘persay’ is not an english word, it’s latin ‘per se’. Love the write up, been testing various builds for the past 2 months. 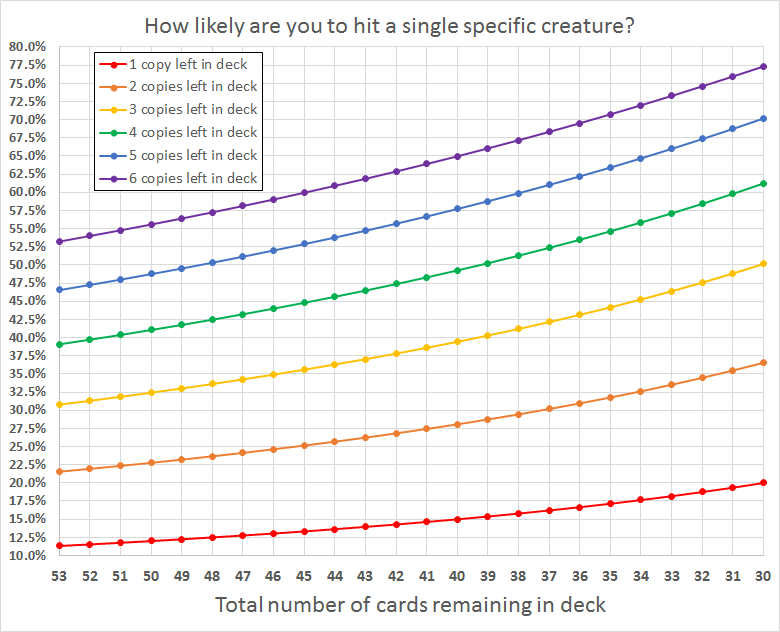 The biggest thing I feel people mess up is their numbers on viable creature count hits, especially once you discount mana dorks and costs of 4 or greater. I made two graphs to better understand the exact percentages. Feel free to use as you want. The second one goes up to “6 copies” for if someone wanted to run 4 viscera seer and 1 varolz and 1 cartel for 6 sac outlets, or 3 anafenza 3 melira, effectively. Whoops I put the same link twice. This is the other. I find it very apropos that a deck built around creatures refusing to die has risen again from what looked like certain death. I do understand your reason for being down on the Spike Feeder/Thune package, given Company’s deckbuilding restrictions, though I will mention that the list that took down the SCG Premier IQ in Portland featured it (and given that you only really need one of each, it doesn’t eat up that much room). Here’s a question, though – what do you think about something like Restoration Angel to double down on a Eternal Witness/Orzhov Pontiff/etc.? It seems that a lot of decks that follow your suggestion and do not opt for Spike Feeder/Thune end up playing this instead. Thoughts?